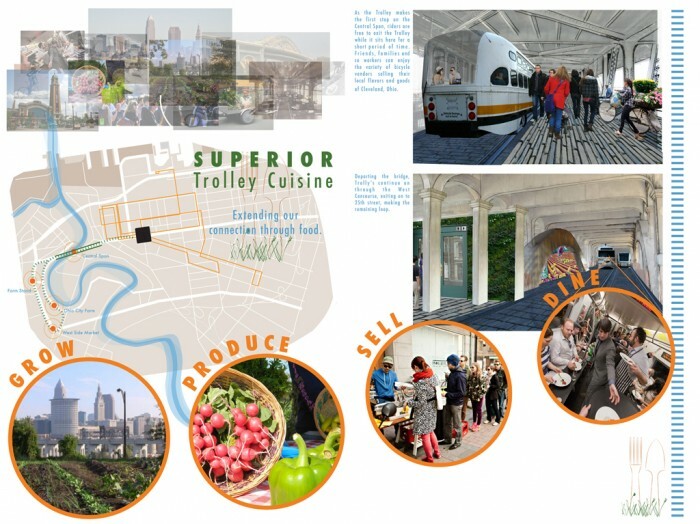 Overview: Reintroducing ClevelandÕs historical trolley; connecting its bridge to its community. 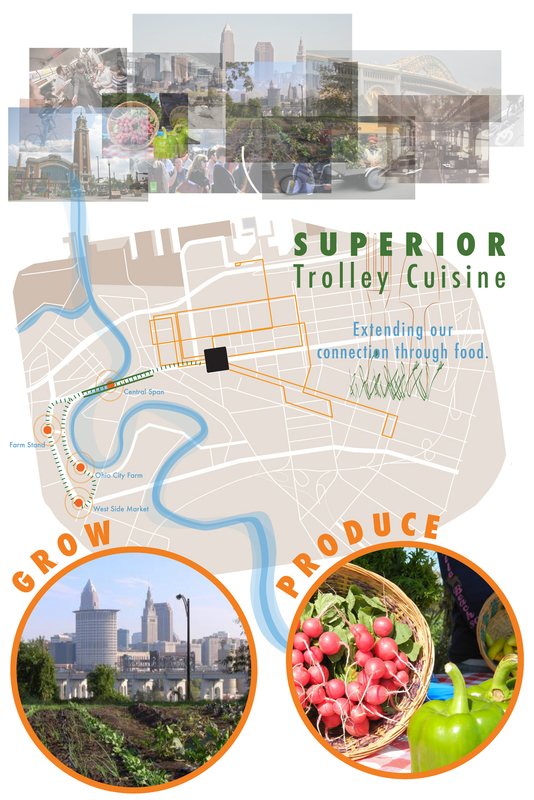 The Superior Trolley Cuisine route transforms the traditional idea of the trolley experience. As part of ClevelandÕs strong attachment to their urban food culture, the West Side Market and the Ohio City Farm, two anchors of the city, will be more prominent than ever. Working together, these two markets create a sinuous network that allows the expansion of the bridges function and enhances our connection through food. A ride along the trolley stops on the Central Span, at the Ohio City Farm stand as well as at the farm and finally, at the West Side Market. Vendors help create this connection by setting up shop along the Central Span, which opens opportunity for events such as international food fairs, local boutique vendors, presentations, classes, pop-up restaurants and appearances by famous chefs from the area. Envision coworkers on break enjoying lunch during the trolley loop, a mom hoping on the trolley to do her weakly shopping at the Market, or even a group of hungry tourists ready to explore ClevelandÕs rich food scene. 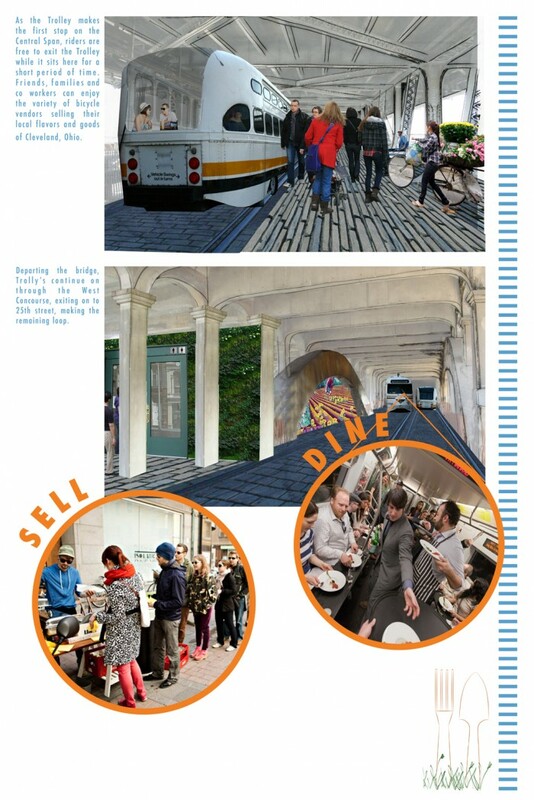 Dining and riding on Superior Trolley Cuisine is ClevelandÕs new take on urban food and community connection.